495 pages | 124 Color Illus. As the field of medical biotechnology grows with new products and discoveries, so does the need for a holistic view of biotechnology in medicine. Biotechnology in Medical Sciences fulfills that need by delivering a detailed overview of medical biotechnology as it relates to human diseases and epidemiology, bacteriology and antibiotics, virology and vaccines, immunology and monoclonal antibodies, recombinant DNA technology and therapeutic proteins, stem cell technology, tissue engineering, molecular diagnostics and forensic science, gene therapy, synthetic biology and nanomedicine, pharmacogenomics, bioethics, biobusiness and intellectual property rights, and career opportunities. Complete with colorful illustrations and examples, Biotechnology in Medical Sciences provides a comprehensive yet accessible treatment of this growing field. "This textbook provides comprehensive coverage of biotechnology as applied to medical sciences. It has a good number of figures that are clearly presented to engage the reader. Each chapter summarises the key researchers in the field and their achievements, which is useful. The chapters on ethics, business, and careers are also valuable sections." "… an abundance of small pills of knowledge that give a broad view of this topic. … This book not only presents the latest developments in basic biotechnology but also covers other less common aspects." "If you read this book cover to cover, you will learn a lot about different aspects of biotechnology in medical sciences. The engaged reader will make considerable headway with this book even outside the medical setup. … [The book] is an anthology of different facets that collectively constitute the field of medical biotechnology." "… could be used as an additional book for an undergraduate biotechnology course or as an introductory book for a graduate student or researcher crossing over into medical biotechnology. 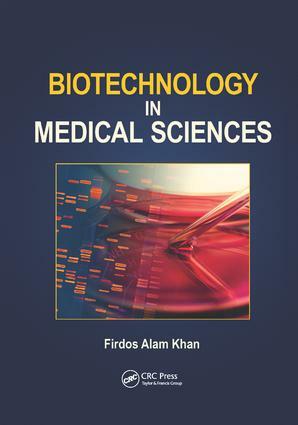 … a good reference book for students interested in learning more about medical biotechnology. … a good introduction for someone not familiar with the field." Firdos Alam Khan holds a doctoral degree from Nagpur University, India. He possesses over 20 years of research and teaching experience gained from his service at the National Centre for Biological Sciences, Bangalore, India; Massachusetts Institute of Technology, Cambridge, USA; Reliance Life Sciences, Mumbai, India; and Manipal University, Dubai, UAE—where he is currently a professor and chairperson of the School of Life Sciences (previously known as the Department of Biotechnology). Widely published, he has been associated with the International Brain Research Organization, France and Society for Neuroscience, USA. A popular conference presenter, Dr. Khan specializes in neuroscience, pharmacology, and stem cell biotechnology—in which he holds two US patents.